Four main types of action can be taken to improve a player's farmyard. A Players can extend and renovate their Wooden huts. B An extended home enables the family to grow. C Fields can be Plowed and Sown and D Pastures can be fenced to hold animals. At the start of the game, each player has a Wooden hut with two rooms. Players can extend their huts by Building rooms using the Build room(s) action. New rooms must be orthogonally (i.e. not diagonally) adjacent to the existing rooms. There is no upper limit on the number of rooms that a player may build. New rooms are always made from the same material as the rest of the home. Wooden huts can only be extended with Wooden rooms; Clay huts only with Clay rooms; and Stone houses only with Stone rooms. Extending a Wooden hut costs 5 Wood and 2 Reed (for the roof), a Clay hut 5 Clay and 2 Reed, and a Stone house 5 Stone and 2 Reed. During the game, the Wooden hut can be Renovated to a Clay hut and, later, a Stone house. The first Renovation Action space becomes available during Stage 2 (rounds 5 to 7). To renovate your Wooden hut to a Clay hut, you require 1 Clay token for each room in your Wooden hut, plus 1 Reed (for the roof). Turn the Wooden hut tiles over to show the Clay hut rooms. For the second renovation - from Clay hut to Stone house - you require 1 Stone token for each room in your Clay hut, plus 1 Reed (for the roof). Replace the Clay hut tiles with Stone house tiles. Players can only ever renovate a complete hut. Rooms may never be renovated one at a time. The Renovation action only allows a single renovation. A double renovation from Wooden hut to Stone house in one turn is not allowed. 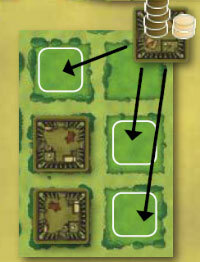 A player who chooses the Build Room(s) action space on the left-hand board may choose to instead, or in addition, build up to 4 stables for 2 Wood each. Stables provide shelter for animals. The Renovation card for Stage 2 allows players to purchase a Major (or Minor) Improvement after performing the renovation - players may not, however, ignore the Renovation action and only play an Improvement. A second Renovation card comes into play in the last round of the game (see Illustration). This allows players to Fence pastures after performing a renovation. In Stage 2 (Rounds 5-7), the after Family growth, also 1 Minor Improvement action becomes available. Players must have room for offspring in their home before they can use this action - that is, they must have more rooms in their home than they have Family members. After taking Family growth, the player may choose to purchase a Minor Improvement. The Family growth even without room in your home action card becomes available in Stage 5 (Round 12 or 13). With this action, a player may grow his or her family regardless of the number of rooms in their home. A player who chooses a Family growth action adds their newborn offspring to the Action space. In the Return home phase, the new Family member is taken home and placed in its room. If it doesn't have its own room, it shares aroom with another Family member. A Player who takes the Family growth action will therefore have one additional (adult) Family member to use from the following round onwards. The new Family member is not available for use in the round when it is produced - it must first grow up. Families are limited to a maximum of 5 members. A player who already has 5 Family members in play may not choose the Family growth action. 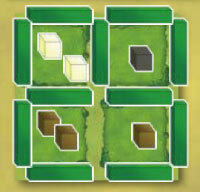 A player who chooses the Plow 1 field action takes a field tile and places it on an empty space in his or her farmyard. If the player already has fields, the new field must be placed orthogonally adjacent to an existing field. Players may use at most 1 Plow Improvement each time they select the Plow 1 field action. A player who chooses Take 1 Grain takes one Grain marker and places it in his or her personal supply - the similar Take 1 Vegetable action becomes available in Stage 3 (Round 8 or 9). The Sow action allows a player to plant 1 or more empty fields: the player takes 1 Grain from his or her personal supply and places it on an empty (fallow) field, then adds 2 Grain from the general supply to the field. Instead of Grain, a player may also Sow Vegetables by taking 1 Vegetable from his or her personal supply and placing it on the empty field. 1 Vegetable from the general supply is added to the field. A newly planted Grain field holds 3 counters, a Vegetable field 2 counters. Grain and Vegetables are harvested during the Harvest. Grain and Vegetables that are in a player's personal supply may be converted to 1 Food at any time - or to more than 1 Food with an appropriate Improvement. If a field is emptied, it can be replanted using the Sow action - a Harvested field does not need to be re-Plowed. In Stage 5 (Round 12 or 13), a new action allows players to Plow a field and immediately Sow one or more empty fields. A player who chooses the Sow and/or Bake bread Action space may choose what to do with any or all Grain counters in his or her personal supply. Grain may be sown in empty fields, be Baked into a loaf of bread and converted to Food or be left in the supply. Baking bread requires an appropriate Improvement with the symbol. A Fireplace allows one Grain to be converted to 2 Food, a Cooking Hearth converts it to 3 Food. A Stone Oven allows up to 2 Grain to be converted to 4 Food each and a Clay Oven allows at most 1 Grain to be converted to 5 Food. Action D - Raising animals: fence pastures, build stables, raise sheep, wild board and cattle. Each player may raise exactly one animal as a pet in his or her home, regardless of the home's size and type. The pet does not take a room away from a Family member. To hold more animals, players must Fence pastures. Each pasture may only hold animals of one type - Sheep, Wild boar or Cattle. Up to 2 animals may live on each square of the pasture: Pastures that occupy 1 farmyard square can hold 2 animals; 2 squares can hold 4 animals; 3 squares can hold 6 animals etc. During the course of the game, players may rearrange their animals at any time, as long as these rules are followed. A player may release some or all of their animals at any time, at will (for example, to make room for other animals in a farmyard space). Animals breed at the very end of the Harvest (see page 5). Animals breed at the very end of the Harvest. one fence may border more than one pasture. Like rooms and fields, all of a player's pastures must be orthogonally adjacent. Fences may only be built if they will create a fully enclosed pasture, with fences on all sides. The edge of the farmyard board, stables, fields and rooms do not count as fences. Each player may build at most 15 fences. Fields and rooms may not be completely surrounded with a fence. Fences may not be demolished once they have been built. If a player has already built pastures, any new pastures must border the existing ones. You may subdivide an existing pasture by adding a fence or fences. Placing a stable in a pasture doubles the capacity of the entire pasture. Stables can be built at a cost of 2 Wood using the Build room(s) and/or Build stable(_) Action space. They may be placed on any space in the farmyard that does not already contain a room or a field, and may not be removed. Stables need not be fenced in: each unfenced stable may hold exactly 1 animal. Only 1 stable may be built in any farmyard space. A player may fence the stable in later, in order to create a new pasture with doubled capacity.